THE PREDATOR franchise has been somewhat of a mixed bag over the years. Much like most of the ALIEN sequels, PREDATOR films have unfortunately struggled to live up to what put their iconic monster on the map in the first place. After a forgettable sequel in 1992 (PREDATOR 2) and a mostly enjoyable standalone/soft reboot in 2010 (PREDATORS), it can be argued that there really hasn’t been a universally loved entry in the Predator franchise since the 1987 original. In an interesting directorial choice from 20th Century Fox, writer-director Shane Black (THE NICE GUYS) has been tasked with taking a shot at revamping the 31-year-old franchise. Ultimately, Black succeeds in hitting his target, even if it isn’t the cleanest of kills. After a noticeably abrupt opening chase sequence in space, a Predator takes a wormhole to Earth to escape from his pursuers. He then conveniently crash lands right next Quinn McKenna (Boyd Holbrook), a highly decorated sharp shooter for the U.S. Military who is able to defeat the alien monster with relative ease after he slips on its iconic wrist armor. Why exactly was the Predator being chased, you ask? Why wasn’t he wearing his armor when he got out of ship? McKenna decides to mail the Predator’s helmet and wrist armor back home to his estranged wife (Yvonne Strahovski) and autistic son, Rory (Jacob Tremblay), so he’ll have evidence that he fought an alien. McKenna is then immediately branded as crazy and lumped together in a bus filled with other lovable misfits. These characters include a suicidal former soldier, Nebraska Williams (Trevante Rhodes); a foul-mouthed Tourettes patient, Baxley (Thomas Jane); and the fast-talking funny man, Coyle (Keegan-Michael Key) to name a few. A deadly Predator escapes from a secret government compound in Twentieth Century Fox’s ‘THE PREDATOR.’ Photo Credit: Kimberley French. Part of what made the original film work so well was how the characters and audience alike were completely unaware of how this monster worked. Nobody knew it stalked its prey from above, nobody knew it used thermal vision, and nobody knew it could cloak itself with that iconic tell-tale shimmer of invisibility. As is only logical with a sequel, audiences now understand these mechanics, while the fresh characters are still frustratingly ignorant to what’s hunting them. So in an attempt to mix things up, Black introduces a secret government agency who has known about the Predators since the beginning and has been studying them in order to prepare for their next hunting trip on Earth. 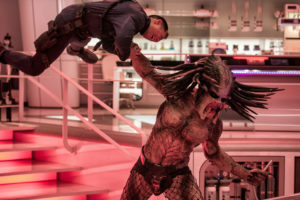 After successfully capturing the Predator from the beginning of the film, they bring in biologist/alien conspiracy theorist Casey Bracket (Olivia Munn) to help them figure out why it came back. The Predator then (obviously) escapes and wreaks havoc on anyone who gets in his way as he attempts to track down his precious armor. In what could have been seen as positive representation of characters with a variety of mental health issues, Rory, in particular, is unfortunately misused. He’s introduced as a 12-year-old kid with an incredible photographic memory, but then we’re expected to believe that he was able to casually read a stack of college level textbooks cover to cover in one sitting and then fully understand the Predator’s language and technology after fiddling with the wrist armor for a few hours. Tremblay does a fine job with his performance, but the level at which his abilities are represented simply goes too far by the end. However, when the film finally does get into the action, it does not disappoint. Heads explode, limbs are ripped off, entrails are torn to shreds – and it’s awesome. Yet, this isn’t just the most violent entry in the series thus far, but it is also easily the funniest. Keegan-Michael Key absolutely steals every scene he’s in, but it’s the banter between him and the rest of the crew that sells their relationships as believable and endearing. While the inclusion of so much humor may be a little off putting for diehard fans of the franchise, the chemistry between these characters is undeniably entertaining. It’s easy to see that everyone involved in this film is a fan of the 1987 classic that started it all. There are the obvious nods to iconic lines like, “Get to the chopper!”, but I particularly enjoyed Henry Jackman’s meticulously well crafted score that pays homage to Alan Silvestri’s original themes. It may go unnoticed by the majority of people in the audience, but including so many of Silvestri’s motifs makes a world of difference and truly makes this film feel connected with the original. 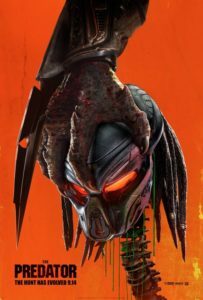 THE PREDATOR is a mostly solid, if not a little too silly, entry to the franchise that’s best enjoyed with a beer in hand and the kids at home. It’s violent, it’s vulgar, it’s absurd, and it’s a great finale to the summer blockbuster season. THE PREDATOR opens nationwide on Friday (9/14).